Sew What? : Welcome my newest family member! Welcome my newest family member! 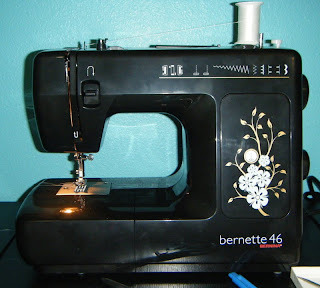 Say hello to Bernie, my brand new Bernina Bernette 46. I had planned on getting the 56 but while I was down there I saw her and fell in love. It's not a ridiculously fancy machine but then again I'm not a ridiculously fancy seamstress. It's a Bernina which I'm already familiar with and there's no computer inside. It's all moving parts. So far I've tried out the button hole foot and started and 80s knit dress and she's been wonderful. I love my new machine! Take that, ridiculous fashion trend!